Do you own and/or operate a business? Are you concerned with the security of the building you work in? You’re not alone. More than seven million property crimes occurred across the nation in 2017 alone. This means that while you may think your doors, windows, and other security measures are functioning properly, it’s advantageous to give your local commercial locksmith a call to check them. What you’ll find in this article are the three ways a commercial locksmith can help protect your business. It’s not enough to hope that your security measures will work in a time of need. You need to know exactly how they will perform and where any potential weaknesses in the system exist. This way you can work to have those weaknesses strengthened, or you can take other action to compensate for less-than-secure areas. Whether you’re securing your commercial property from vandalism, burglary, or internal theft, Firstline Locksmith is here to help you shore up your business security. 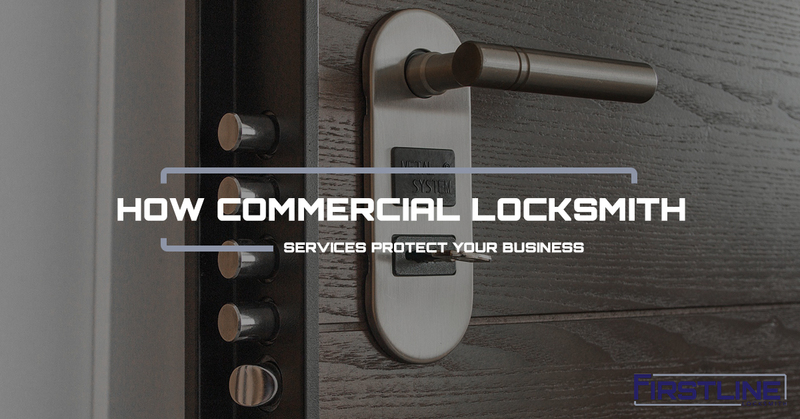 As a commercial locksmith company that serves Newark businesses and the rest of New Jersey, we know what it takes to secure your building. If you have an employee or executive that is let go, it’s time to rekey your locks. As much as this sounds like a paranoia-driven move, it’s a move that can save you thousands in theft and damages later down the road. It’s tough to accept but the person you knew who just got fired may show a different side by using their access to your building to do damage or steal company property. What’s more, the person who got let go may not be the one who does the crime. In fact, that person may sell their office key and be none the wiser about when or how the criminal commits their crime. A commercial locksmith company can help you rekey your locks and keep those out who need to stay out. Whether your locks recently deterred a crime or they’ve simply worn out, it’s best to fix damaged locks prior to them failing entirely. Locks are similar to gadgets or other tools you may use around the house: the more you use them, the quicker they wear out. The best time to replace or fix a damaged lock is before it stops working. A damaged or failed lock allows criminals easier access to your building and assets, if they decide to target your business. Instead of hoping that your locks are in proper working order, let your local commercial locksmith know that you’d like them to come take a look. Do you give your employees keys? If so, you’re putting your business at risk. Do you duplicate one key to give to multiple people? You’re putting your business at even more risk. It may seem easy to just duplicate the master key for those that work for you to gain access to the building; however, this is a practice that leads to more than 30 percent of employee thefts against their employers. Instead of simply duplicating keys, install high-security locks or keyways that give each employee individual access to the building. While this may seem like a more expensive option, consider the loss of assets due to an employee stealing from you; it’s not worth the headache. It can be tough to choose between so many commercial locksmiths that serve Newark. What you need to focus on is reputation, experience, licensing, insurance, and bonding. A company that has all five of these is a great choice to allow to bid on your project. After years of serving New Jersey with commercial locksmith services, Firstline is your best choice for your commercial locksmith needs. When it comes to rekeying your locks, fixing damaged locks, or installing new locks, we’re here to assist you how ever we can. We’ve served major corporations like Wal-Mart, GoWireless, Rite Aid, and the Department of Justice. We’re not your average locksmith in Newark. Give Firstline Locksmith a call today to start the conversation.